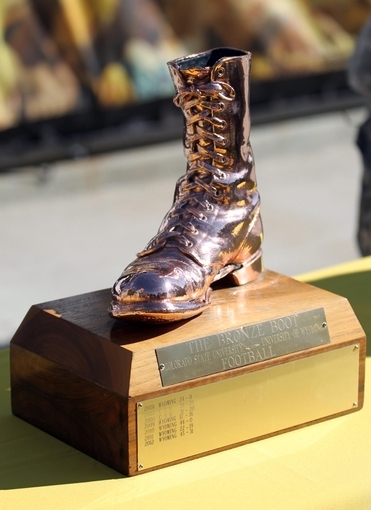 The Bronze Boot is back in Laramie! Wyoming came out on Saturday and got a convincing win at Colorado State lead by an impressive defensive effort and a strong running game. It was a great bounce back effort after a let down in Michigan. Suddenly the Cowboys are 3-2 and are hosting 4-0 Air Force on homecoming. This Saturday’s match up should be a good one. Let’s look deeper into it and the win over CSU. 1. Saturday night’s win was fun. Wyoming came to play last week and they showed the ability to bounce back and get a win. Coming off of a disappointing road loss at Eastern Michigan a week ago and then falling behind early 14-3, things could have gotten away from the young Cowboys. Instead, the Cowboys turned to their star running back, Brian Hill and he ripped off runs of 15, 16, and 39 yards on consecutive plays leading to a Shaun Wick touchdown. On CSU’s next offensive play Marcus Epps caused and recovered a fumble. Then came the play call of the night, OC Brent Vigen dialed up a reverse flea flicker and Josh Allen found a wide open Tanner Gentry in the back of the end zone for an easy touchdown. All of the sudden, in the matter of less than 30 game seconds Wyoming went from down 14-3 to up 17-14 and the Pokes never looked back. The game was just fun to watch and it seemed like Wyoming couldn’t do anything wrong. Chase Appleby’s pick 6 was awesome and capped off an impressive scoring run in the second quarter. In the second half, the defense pitched a shutout and the offense ran the ball at will. It was a gratifying win for Wyoming and head coach Craig Bohl, and if you saw his smile on the sideline that was easy to see. Let’s hope this win propels the Cowboys going forward, I think it is a sign of things to come. 2. The play calling was better. I thought overall, the play calling was better than week’s past. The best play call of the night was the reverse flea flicker. Coming off of a touchdown and then a fumble recovery they couldn’t have picked a better time to pull out some trickery and it worked to perfection. I thought Vigen put the offense in a position to be successful all night and they ran the ball outside the guards and tackles more than they had in previous games. The biggest concern for me coming into the CSU game was what the halftime adjustments would look like and I thought the Pokes made some excellent play calls in the third quarter and it allowed them to put the game away. The 4th quarter was basically run the ball and get out of Fort Collins healthy and we hardly even saw Brian Hill. Hopefully we see more of the same this week against a stout Air Force defense. 3. The offensive line rose to the occasion. The offensive line had some issues in the game at Eastern Michigan in both pass and run protection. We all knew in order for Wyoming to be successful at CSU, they needed to be better. Well, they were a lot better and the success Wyoming had running the ball reflected that. The pass protection was lacking at times, but all and all the line came to play and because of that, the Pokes were able to get a win. They will need to be just as good again, if not better this week. Air Force comes in with a very good run defense and you know Wyoming is going to want to run the ball. If they aren’t able to get Hill, Wick, and Allen going with their legs then there will be a lot of pressure on Josh Allen to get the job done with his arm. Allen is more than capable of doing the job with his arm, but he will need time to throw the ball. If Allen has success through the air, then the running game can get going a little too. The offensive line might be the most crucial area of the game in order for Wyoming to do well Saturday. 4. The biggest moment in the game was CSU’s missed field goal and Wyoming’s response. Wyoming had all momentum when they got the ball with 12:40 left in the third quarter up 24-14. They then ran the ball 9 straight times down to the CSU 30 yard line and it looked like they were going in for another score. Then they had an incomplete pass followed by a 8 yard run by Allen. This set up a 4th and 1 from the CSU 23. Rather than kicking a field goal, the Cowboys elected to go for it. I still love the call, Wyoming had all momentum and Brian Hill was in a good rhythm. But instead of putting Hill in the backfield, they gave the ball to Shaun Wick and he couldn’t convert. Suddenly, all momentum was lost and CSU took over on downs. They turned around and hit plays of 25 and 42 and found themselves down 10 with the ball on the UW 10. The Cowboys defense stepped up and stopped CSU on 3 straight plays. At that point CSU had been 16/16 inside the red zone in 2016 and they looked in line to make it 17, all they needed was for K Bryan Watt to convert a 24 yard chip shot and CSU was right back in it, down 4. THEN, Watt missed wide right. This was a big play in the game and Wyoming’s response was even bigger. The Cowboys took the ball and went 5 plays for 80 yards, capped by a Brian Hill 1 yard touchdown. Suddenly the score was 31-17 rather than 24-20. This was instrumental and the Wyoming offense did exactly what they needed to do, capitalizing on CSU’s error. The defense then came out got a 3 and out and Wyoming capitalized again on a CSU error, this time a terrible punt and the offense went 6 plays 37 yards and it was 38-17. Ball game over. This was a sign of growth, CSU had seized momentum but made an error and the Cowboys saw their opportunity to take the game over and they did just that. 5. The Fly Boys are in Laramie and it is homecoming, this Saturday should be fun. The weather report shows mid 60’s on Saturday, it is homecoming, and the Cowboys are hosting a very good Air Force team, who happens to be undefeated. Fans on both sides couldn’t ask for a better scenario to take in a football game. This is my favorite game of the year, personally. I think the rivalry has gotten very intense in the last 5-6 years and it gets very physical and chippy on the field. It should be strength vs strength on both sides of the ball. Wyoming’s running game vs. Air Force’s run defense and Air Force’s option attack vs. Wyoming’s speedy run D. This has all the makings of a great Mountain West game. Wyoming fans, if you can be at War Memorial Stadium Saturday, then you should be. You aren’t going to want to miss this one and the Cowboys need and deserve your support.